David: There seems to be two limits to your music. There's one which seems to be the comedy side, and there's the other which seems to be highly-composed and highly-thought-out. Do you tend to swing between these two because you like them both as much, or do you prefer one from the other? Zappa : Well, let me give you an example of how people's listening habits can sometimes lead them astray. If you listen to "Live At The Fillmore" and you listen to only the text, you'll perceive it as comedy music, but did you ever listen to what the instruments are doing on that album? David: On the last tracks – on the comedy tracks? Zappa: On the whole album, just stop and think. And on the "Jets" album the backing tracks accompanying the vocal tracks which have simplistic love lyrics are pretty subtle. In fact there's a couple of musical references in them that have only been spotted by one or two people world-wide. There's part of the "Rites of Spring" and the out-chorus of "Fountain of Love" – would you recognise that? Zappa: It's been disguised but not so disguised that you couldn't hear it. That's also the second time that an extract from the Rites of Spring has been used in a Mothers of Invention album. Zappa: It's in "Duke of Prunes" on the "Absolutely Free" album, the second album we had out, so it functions as a reprise when you consider the whole body of the work. As far as the completely orchestrated stuff goes, many people hearing these things that do not have a text don't hear the humour in it, in what the notes are saying and the instruments that are playing the notes. If you consider the normal function of an instrument and the way an instrument is expected to behave in an orchestral ensemble and if you assign a function to that instrument that takes it out of its normal character that's an element of humour. Also, some people think that the "Hot Rats" album was completely scored out. Well, it wasn't. Here's how the "Hot Rats" album was made. It started out with basic rhythm tracks that were done by a four-piece rhythm ensemble and all the rest of the parts were over-dubbed on top of that and much of it was written right there in the studio. Ian: How long did you spend on that album? Zappa : The rhythm tracks took approximately ten hours, but to complete "Peaches and Regalia" took 100 hours in terms of over-dubbing for that one song and there's only four people playing on the album at any one time on any of those tracks. David: Do you tend to think of yourself more as performer or a composer? Zappa : I consider myself a composer except that most people think of composers as people who write dots on a piece of paper. My idea of being a composer extends to the organisation of materials which are not exclusively musical. My compositions deal with not just the notes that are being played, the instruments that are playing them but also involve the people who are playing them. Each ensemble of personalities produces a different result even though you are playing the same written musical material. So it's a musical, chemical, psychological, elaborate sort of composition that's happening. When you consider that a lot of the stuff we do on stage is improvised for personnel combination and the mood they're in at the time, it has a lot to do with the music that's coming out. Ian: Does that also happen in a studio if perhaps some other musician comes up with ideas? Would you listen to them and perhaps use them? Ian: Were you pleased with the finished record of the "Mothers Live"? Zappa: It was OK – you know. There are plenty of problems with recording anything live. Some people think it's a good live recording. I happen to think it's a little bit dull sounding. It doesn't have enough a top end to it. The album's pretty much how we did our show at that time – just straight through in that consequence. In order to prepare a piece like that took an immense amount of rehearsal and quite a bit of thought in the planning and structure of it. Every time we did it, it had open spaces in it where the two lead singers were free to improvise dialogue that related to that particular audience or to a scene that might have taken place shortly before that time. It was designed to be performable by them because they had definite limitations as musicians. For the album we played the Fillmore nights. But "Just Another Band From L.A." was virtually only one show and what you hear on the record is virtually the performance straight through. The first bunch of Mothers were sort of musically raggedy. They were mostly unschooled and unskilled – most of them were right off the street. They got into the conceptional theatre aspects of what we were doing and found it logical to go out on stage and do some of the crazy things we were doing. It was a reasonable extension of their personalities, so there was nothing artificial about what they were doing. I wanted to share these personalities with the audience. If you have special abilities within the members of the group why keep them stashed away? If you have some weird little thing then you want to amplify that but the things that they couldn't do was do a show consistently that was spot-on. They just didn't have the ability to do that and Mark and Howard did. They were real vaudeville performers. I'd got tired of trying to sing and started playing instead. Then we got Mark and Howard in the group to sing – they sounded fine but as the tour's progressed they started screaming their lungs out and Mark's voice blew out completely. The reason they were screaming their lungs out wasn't because that was the way I was writing the material for them. I could've have written them anything and it still would have happened because they didn't, Mark especially, look after their health. So I was becoming a little dissatisfied. I was writing a part that wasn't getting sung in tune on stage, but in terms of what they did on stage, they were very spectacular. They jumped around a lot and when you consider that an audience goes to a concert more to be entertained than anything else, they were the ideal thing. "The Fillmore" is actually based on incidents that happened to the people in the band. I didn't invent those situations, they really happened. "Magdalena" is not a true story but it could have happened. Ian: With the vaudeville part coming more into pop music today, what are your views on such artists? 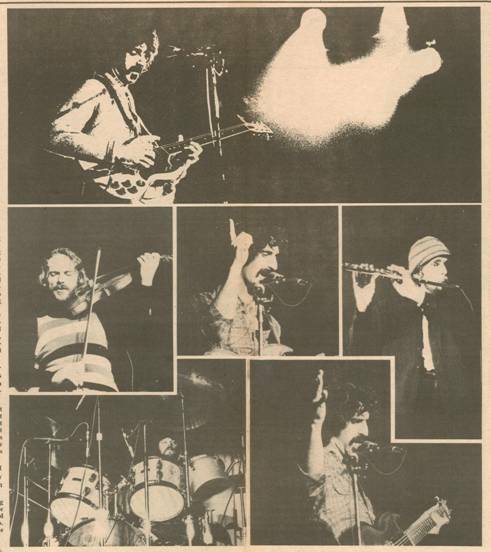 Zappa: I think it's nice that there are groups playing that sort of stuff for people who want to see it and hear it. We're not doing it. There are three pieces that we do that involve some sort of choreography and that's pretty limited. Ian: Do you think a lot of groups and artists have followed suit from the Mothers? Frank: Well if they're going about weird activities on stage they have, yeah, because we did all that stuff a long time ago. We stopped doing it a long time ago. David: Do you think you followed the Fugs though? Zappa: No. We had no knowledge of the Fugs when we started. We didn't see them till we moved to New York. David: Do you think way you're like Roger McGuinn – there was a band called the original Mothers for which you got the right of title and you've called your band the Mothers ever since. Frank: I have a perfect right to call every one of those bands the Mothers for this reason – what they're playing is Mothers' music and Mothers' music can only be played by people who have stayed together long enough to be able to express it as a group. If I write a piece and hand it to an orchestra it's not Mothers music. Or if I write a piece and hand it to a group of studio musicians I'll get perhaps a note accurate performance. But it won't be Mothers' music unless I get an individual sum-total craziness of everyone in the group, and you can't extract that unless the group has worked together for a long time, has been together on the road and has had a chance for all the personalities of the people in the group to blend to a point where they can feel comfortable being weird in a performance situation. David: But does that apply to the Grand Wazoo album? Wasn't that a studio group? Zappa: Well, to this extent. Two tracks were using 17 pieces but the basic rhythm section that was being used were all guys who had been in the Mothers before. Zappa: It takes anything from three to six months. It just depends on how hard you're working during that initial period when the group is formed before you can actually see that the people in the band know what they're doing or know what it is that's expected of them when they get out on stage. The first step is that the material is presented to them and they have to learn how to play it, then they have to memorise it, then they have to go out there and play it till they're comfortable with it. Then when they know it we can start taking it apart and twisting it around and putting personality into it, and it takes, depending on how hard the stuff is, an increasing amount of time. Ian: And what about in the studio when you're putting down a record? Zappa: Well, there's various procedures that I've used in recording albums and the new album which is out in the States in about four weeks is done in layers. Did the rhythm section – brought them in – most of the material they'd already played on stage – so I put the finishing touches on it as we "layered down". Certain things that are good for performance on stage were omitted on record because they didn't add anything to the event on record and certain things that would be impractical on stage were included to add interest to the record. After the rhythm section was down the vocals went on. And after the vocals we put on the horns, then the guitar solos. It went on in layers like that. I think it added to about two or three hundred hours onto this album. Jenny: Would you say that your music is more a reflection of what's going on around you or what's going on inside you? Zappa: Well I don't think anyone's really interested in what's going on inside me so much as hearing something on a record or at a concert that corroborates their viewpoint or gives them a chance to agree or disagree with what's been put forth. I think the basic purpose of what I do in terms of the text of the stuff is more like reportage. I see certain things happen to me or around me. Jenny: Do you ever censor yourself? Zappa: Sure. That's even more necessary now with the new Supreme Court Ruling in the United States so now it's up to the individual communities to decide and use their own discretion as to what is and what isn't obscene. The difference from community to community in the U.S. and the extent to which you can be prosecuted is pretty frightening. I mean, you get one guy or District Attorney or policeman in one small town that you go to or send a record to and he's going to go "Aha, I'll get my name in the papers with this." Ian: With state laws varying so much from one state to another in America, do you find that audiences, because they must abide by their particular state laws, treat your shows differently. Zappa: Oh yeah, every audience is different every night. We've only had one incident of a live performance where we've had any trouble and that was at Virginia Beach, Virginia which is a southern state. We were playing two shows on the one night and we were performing "Billy The Mountain" and somebody complained at the end of the first show to one of the policemen who was there, and they came back and lodged a complaint with our road manager which was then relayed to Mark and Howard who were doing the lead singing at that time. They said we shouldn't say a certain word that they were saying at the end of the number, and they were offended that somebody should ask them to change what they were doing, so they went ahead and said it anyway. We just went off stage and the whole dressing room was full of policemen who wanted to detain the whole band. They finally said that they were going to arrest the two lead singers. So they went over to the little jail and put them under arrest and were released under $1000 bail and were supposed to come back and go to court. Well, we finished our tour and arrangements were made for legal counsel and all the rest of that stuff and then two weeks before the thing was supposed to come to trial we received a notice in the mail saying that they had already been tried and convicted and that bail was forfeit. There have been two or three cases where albums have been complained about by parents in some east coast towns. David: Can you tell us something about your film, 200 Motels, which has been banned out here? Zappa: Well, you may be able to see it because I'm trying to get an appointment to see the guy who is head of your censorship here. David: Is it really conceived as a sort of anti-film, like you can actually see parts of the sets that are phony, and you can look out the window and you'll see the rest of the studio. Is that right? Zappa: It's written into the script that that's the way it's supposed to be. David: Were you pleased with the outcome of the film? Did it work out according to your original concept? Zappa: Up to a certain point it does. I think the things that are wrong with the film could have been corrected with more time and money. David: Despite the lack of shooting time, the film really was meant to look like that, wasn't it? It was meant to be ragged? Zappa: No, it wasn't meant to be ragged. I'll tell you exactly what it was meant to be. It was meant to be exactly what was written in the script. The script was over 300 pages long with details that specified how every camera was supposed to be and all the rest of that stuff, but it was the first feature film to be shot in video and we had to pioneer all the negotiations with the various unions that became involved because you had to deal with video and film unions all at once who were stepping on each others toes at the time we were producing it. You had the Royal Philharmonic Orchestra who were actually supposed to be playing the music live while we were filming, and that's a procedure that hasn't been used for 40 years. It was quite a risk to take but that's the effect I wanted. Ian: Being in so many facets of entertainment and of having a sometimes bizarre and rather varied image – of being a musician and being a composer – what really are aware of the most? taxes you the most? Zappa: The hardest thing about what we do is trying to make all of the electronic equipment that we use on stage work every time we set it up. There are 302 sound sources on stage that go through 302 wires out to a mixing board out in the audience, and every time you play some place you have to set it up and make sure everything is working. Sometimes that will take you four to six hours before you have to come back that same night and play a concert and that's hard. We're recording a live album here in Australia and we had three very good nights in Sydney where everything seemed to work and everyone was playing very good and I think we're liable to come up with something that sounds even better than the Fillmore album out of this tour. We have some Australian crew people helping us out but the guy who is actually doing the mixing for the show is from America. His name is Steve [Desper] and he used to work with the Beach Boys. We've made arrangements here in Melbourne to use a 16-track facility and there'll be an Australian engineer who'll be mixing for the tape. Ian: Will that be John French from T.C.S.? Zappa : I don't know what his name is. That sounds right to me though. He'll have to be good to get this show down on tape because it's complicated. Ian: Will it be for world-wide distribution? Zappa: Yeah. I think the stuff in there is of sufficient interest that people outside Australia might get off on it. David: All the bio's on you say you started out in music because you bought a recording studio. Do think you actually became a musician by accident, that you in fact started out as a composer but now are a highly respected guitarist? Zappa: I've always been able to play, but the more chances you have to play with better people the better your own individual skill can be. David: When's the 9-album set coming out? Zappa : When there's no more Mothers. Ian: That surely shouldn't be for a long time? Zappa: Probably not. I don't think there's any immediate need to release that because we travel. We have the policy now to record every show we do, I have the chance to extract the best of all those shows for putting albums together and if I don't come up with a live album per season that makes any sense then all the rest of that material gets stored and reorganised to extend the boundaries of that 9-record set. Ian: Was the "Mothers Live" difficult to mix once you got it back to the studio? Zappa: Oh no, that was an easy mix. The easiest mix of all was "Just Another Band From L.A." 'cause it was recorded 4-track and it took about a day. Jenny: We heard that you'll be singing a lot of the tracks on your new album. Zappa: Yeah, I'm singing on all of them. Jenny : Along with the Ikettes and Tina Turner? Zappa: Yeah, that's a surprise too! David: Of all your albums, which is your favourite or favourite three perhaps? Zappa: I'd rather not answer that. Jenny: Do you ever play them? Zappa: Sure, I listen to them all the time. Ian: Do you find new things in them yourself? Zappa: Sure. One thing I do is criticise the production of them. Considering that studio production facilities have increased so vastly since we first started making albums – our first albums were all done 4-track, now we're doing 16-track – and every year there are new devices that allow you to get a better sound on record. So I listen to the old things and figure out how I might remix them to get the sound out better. The new album that's coming out is quad, and all the rest of our albums will be quad from now on. It's recorded in quad. Like for instance, instead of miking your drum set for a two-channel spread we have four overheads, and the placement of the kick drum comes up in quad centre so that when you hear the drum set you're sitting on the drummer's seat and it's all happening around you. The reality of the performing Frank Zappa was much more stunning than the expectation. The announcement of his concerts brought flocks of Australians who had been weened during their teens with the bizarre servings of the Mothers Of Invention. Although his music since then has been well received and digested the memory of those first works lingers. I think the audience almost hoped to witness that old Zappa, the "ugly" image, performing insanities. The freak king. Instead an agile figure bounded onto the stage in street-type clothes with the rest of the band. A minimum of announcement. Equipment and musicians on a bare stage. A little lighting. Instead of the scowl a relaxed, well-adjusted smile played on Zappa's face. Zappa took the opportunity of introducing the individuals in the band to also test the levels, etc., of all the equipment before commencing. A few adjustments were made, a dig at Melbourne's infamous "shed", the Festival Hall ... and then the music. The first number can only be described as a jazz-like warmup, the band following the dexterity of Zappa's finger as it waved time and pointed at whoever it wished to take the lead. The long, crooked lively finger brought forth its avalanche of music. What followed were more formularised songs, complex musical patterns that had been created by Zappa which he and the band toyed with, pulled at, improvised and humorised. The whole aura of the music was full of suspense and surprise, brilliance and foolery. It was obvious that something very special was happening before our very eyes and ears, something that was being created that very moment and would never be recaptured. This was no impeccable replica of what has gone before. Australia was being handed a whole new set of songs, no theatrical representation of a record we had learnt. The audience was stunned. There aren't many words for the experience of Zappa on stage, other than that he had me engaged for the full length of the concert with pure music. He's obviously very much in control of his companions, continually testing them and pushing them to new heights. But the watchful eyes of the band gazing at Zappa showed that he was no tyrant, but a respected master. One very respected friend who has seen every rock and roll concert to attend this country from the very earliest Lee Gordon shows, was heard to say that this was the ultimate musical experience, more so even than Yes and Jethro Tull. I was unfortunate not to see either of those bands, but Zappa exhausted me with his imagination.